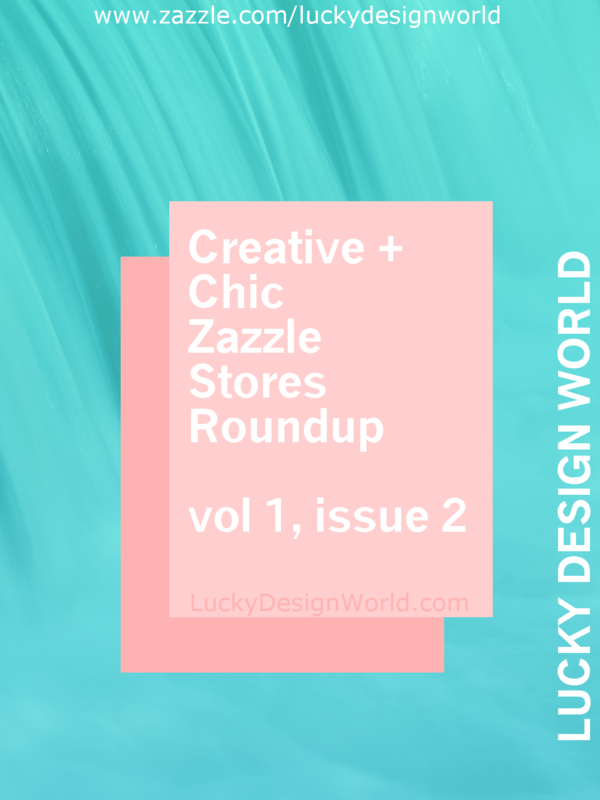 Because the previous and first issue of Creative and Chic Zazzle Stores Roundup was successful, there is now a second one! This issue continues the theme of Zazzle stores but features established stores. One thing to remember is that the Zazzle Market Place is gigantic and because I’m there everyday is becomes second nature to spot what is trendy and what is unique. The products in this issue are all quality! This first design is related to nature! It is called “My Happy Place Forest Trees Hiking Camping” tee. It features evergreen trees in various sizes with two bright little stars and a low crescent moon shining on them. It also looks like there is water on the bottom represented in waves. It’s a wild forest habitat! Where do you think it is? Could it be one of your favorite forests? In any case, the text: “My Happy Place” makes it yours! It’s a minimal design with no other patterns so it looks modern and fresh. This would be a great gift for anyone who likes camping, hiking, being outdoors or even a cute little gift for Earth Day! More related designs can all be found in the collection called : Nature Lovers Gift Collection. Currently there are over 20 designs including tees with a tent design, mugs with the Explore Nature design and Lucky to be in the Mountains tee! Visit the collection to see them all! This next design is a cute one because it’ so fun and cute! Last issue also featured a gold fish on a mug: it was called Blue Cat with Goldfish. One of the designs at Lucky Design World’s Store is goldfish too! (Such as A school (shoal)of Yellow Goldfish). Present’s of Love Design has the fish wearing snorkling gear! This design is a cartoon and hand drawn, it continues the minimalist theme, where there is nice lines and the background of a rich blue highlight the fish. See this design reminds me of a summer vacation or island holiday! Wouldn’t it be a fun gift to customize it and add a location of a destination or add your name (or gift recipient’s name)? This design would be perfect for anyone who is a crafter, someone who sells handmade goods -perhaps at a local farmer’s market, someone who sells bakery or someone who is gifting at a shower, party or special occasion. This next store has an assortment of the collections of their adventures! There is a wide range of designs featuring Utah and other locations, Police themed designs, Teacher’s Gifts, Patterns for backgrounds, Christmas Holiday designs, abstract art and even more! This store is worth browsing! Floral designs are a favorite, just like in the previous issue there was the pink daisy hedgehog design for a pillow! This store has a cute one too! And, of course, it’s pink! This is a photograph of wildflowers. Each of the flowers really pop out and are so colorful! There is pinks, purples, blues, whites and coral shades to the flowers. It is so beautiful! Wouldn’t this mug be perfect for a Mother’s Day Gift? How about a birthday gift? or even a cheery mug to have to have with you when you read books on a rainy day? Continuing with the floral designs is this next one! It is an orange tiger lily. It reminds me on sunny spring and warm summer days! Did you know that tiger lilies symbolize confidence and wealth? That’s another reason that add’s to it’s beauty and charm. This notebook can be personalized to add your name or your gift recipient’s name. Last but not least, this design is a poster that features wild horses! Real wild horses out in the American West! Roaming wild and free. There is a stunning mountain range in the background. Did you know that according to feng shui, horses symbolize power, freedom, strength, perseverance and success! This poster would be the perfect gift for any horse lover, or anyone who appreciates nature, or the Wild West! 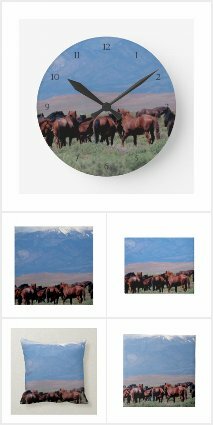 For more products with this image, please see this collection Horse Home Decor. 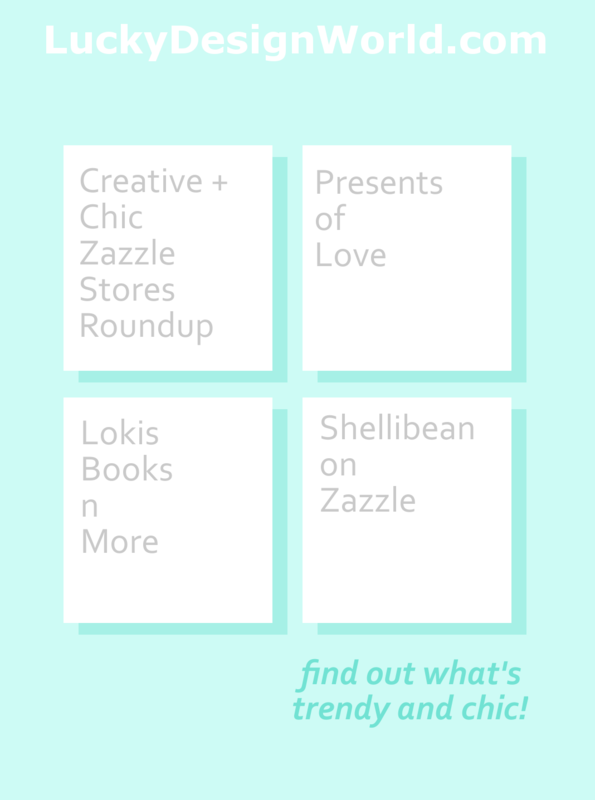 Shellibean_on_zazzle is a variety which means you’ll always find something new and unique! Visit often to browse the eclectic designs! 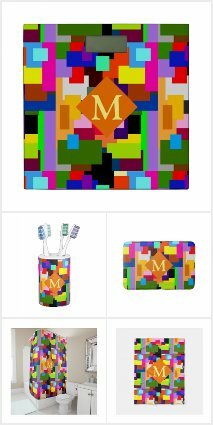 Some of the design themes you will find at the store are abstract art, patterns, back to school, Faith and Encouragement, Holidays, Wearables and much more! Another nice option is that if you see something you like but want it in a different color or monogram, just contact the designer! The first design in the showcase gift guide sample is a mug! Its a monogram design with abstract art. Its displayed in a random abstract patchwork pattern and each patch is in a different rainbow color including grey and neon colors. The monogram portion is displayed in the center and it’s an pastel orange diamond motif. It’s well done and could be in an art gallery. It’s cheery and bright, which would make great gift idea for someone who loves coffee, tea, hot chocolate, or likes to collect mugs or for a coworker. This design is part of a growing collection, check back often, since more is being added! Here is a mini preview of more! The next design features three blue vintage dragonflies! This design modernizes the vintage dragonflies by having a minimalist background of choosing white as it’s background rather than having a pond or water scene. It makes the cute bugs really stand out! Did you know that a dragonfly symbolizes wisdom and emotional maturity? And did you know that according to Japanese culture, the dragonfly is a symbol of courage and strength? Worldwide the dragonfly has positive attributes. And if a dragonfly lands on you … it’s good luck! Wouldn’t this luggage tag make a great design for a gift or just for yourself and add a little bit of beauty and grace to boring luggage? The next design is featured on a tote! It has a cool etching design of a mountain range and a forest with some snow. It’s a vintage winter design made modern. It’s bold in some portions and other portions the lines are very delicate looking. The design is well balanced and harmonious. Wouldn’t this design look great not just winter time but all year? To carry books or groceries? What do you think about these designs and products? It’s a preview of the abundance of creativity and product selection available in these stores. Visit them today! Thanks for reading this second edition of Creative and Chic Zazzle Stores Roundup. 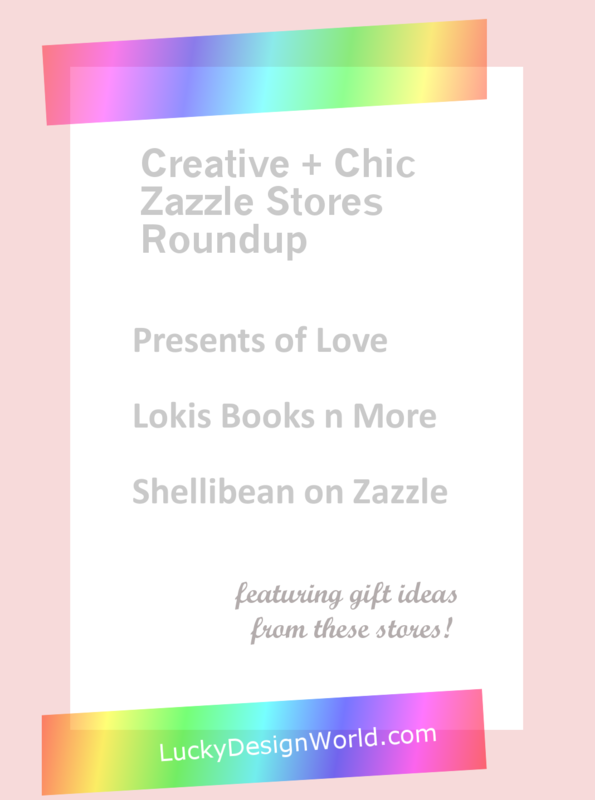 This concludes the second issue of Zazzle Stores Roundup and I’ve mentioned it the last time and have to mention it again: It’s been really fun! …Have thought about blogging yourself? If yes, then I’d have to recommend using Siteground because they provide safety along with speed. With brilliant and excellent customer service – they know their stuff and are going to help you along the way! Not to mention, great bargain prices ! Try Siteground today!